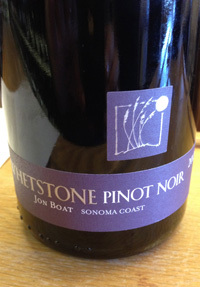 2012 Whetstone, Pinot Noir, Jon Boat, Sonoma Coast. Jamey Whetstone is making some great wines, and the 2012 looks to be a breakthrough vintage for his own label, with a glorious lineup of fine Chardonnay and Pinot Noir, I really liked every wine and it was tough to pick the top, but I finally decided to highlight his Jon Boat Pinot from the Sonoma Coast, it was complete, focused and delicious. From start to finish this 2012 excites and entertains with silky flowing fruit and good defining acidity and drive with good density and subtle wood. The nose has raspberry, roses, mineral and toasty notes leading to a palate of sweet bing cherry, plum and mixed berry fruits along with a touch of wet stones, mineral and tea spices. The body is lush and round, though it is not flabby, but certainly there is more stuffing than was found in most 2011 wines and there is more textural feel and pleasure, this is a super vintage. Don’t overlook Whetstone’s Chardonnay either they were right on as well, if you’ve not had the ex-Turley man’s wines yet, this 2012 is a place to start. The 2012 Jon Boat Pinot Noir is a pure wine that is starting to unfold nicely, it could be enjoyed young and it can age another 5 to 7 years easy, this is one of the best to date from Whetstone and it should develop and gain complexity over the next 2 years in bottle.